ASTANA – Kazakhstan is keen to strengthen the United Nations further and is willing to assist in expanding its presence in the country, including through the establishment of a UN regional diplomacy hub in Almaty, the country’s foreign minister said. 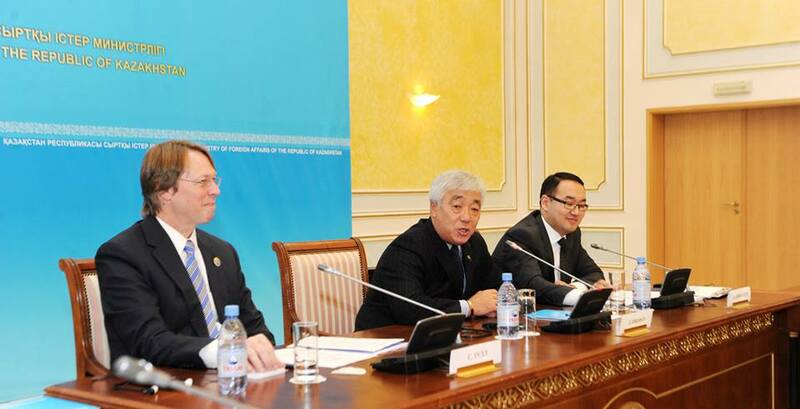 Minister of Foreign Affairs Erlan Idrissov made a statement at a roundtable devoted to UN Day on Oct. 24, “The United Nations and Kazakhstan: 2015 and Beyond.”. Deputy Foreign Minister Yerzhan Ashikbayev, UN Resident Coordinator in Kazakhstan Stephen Tull and other officials also addressed the audience at the event at theKazakh Ministry of Foreign Affairs which includedleaders of UN organisations’ offices in Kazakhstan, the diplomatic corps and representatives of non-governmental organisations (NGOs). Kazakhstan and the UN have been celebrating UN Day together for the last two decades. 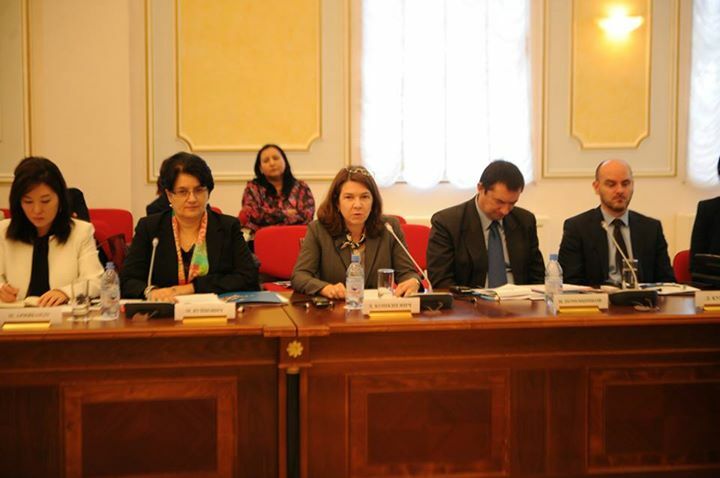 Over this period, the partners have developed successful and beneficial cooperation in many areas, officials said. “We are grateful for the contribution of UN experts and the leadership of the United Nations’ specialised institutions whose support has been instrumental in developing and consolidating newly-independent Kazakhstan. 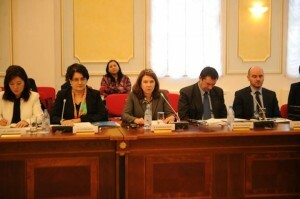 For over 20 years we have been fruitfully cooperating on a multitude of projects on poverty reduction, healthcare and education systems, social services, sustainable development, improving environmental conditions and the efficiency of public administration, as well as many other sectors,” Idrissov said in his welcoming speech. The minister mentioned that much of the knowledge generatedby mutual cooperation has been channeled into long-term development programmes. 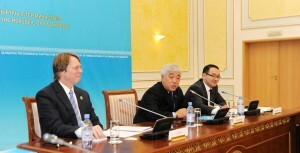 He noted that Kazakhstan is aiming to enter the top 30 most-developed countries by 2050. Therefore, the vision reflected in the country’s Kazakhstan 2050 Strategy is fully consistent with the objectives of the UN’s Millennium Development Goals. According to him, the strategy highlights a number of areas related to health, social imbalances, professional state and regional and global security and sets ambitious targets for the renewable energy sector. “The UN, with its noble principles and values and its broad scope of responsibility and outreach, is a core element of a new world order. We all are working to increase the relevance of the UN in the face of the multidimensional threats and challenges the world is facing today,” Idrissov said. Tull briefly described the history of the UN, saying that United Nations Day is devoted to making the aims and achievements of the institution known to the people of the world. The organisation was created following World War II to prevent another such conflict. UN Day is part of United Nations Week, which runs from Oct. 20-26. Ashikbayev noted that in order to make contributions to global peace, the Kazakh government is bidding for a non-permanent member seat on the UN Security Council for 2017-2018. That election is to be held in November 2016 at the General Assembly in New York and the pace of Kazakhstan’s campaign permits guarded optimism regarding the outcome. According to the deputy minister, Kazakhstan will continue to strive to make its contribution to multilateral efforts to promote peace, disarmament and non-proliferation, sustainable development, environmental protection and the rapprochement of cultures, as well as working on other fundamental issues. “I would also like to use this opportunity to stress that the initiative of making the city of Almaty a regional hub of multilateral diplomacy is advancing at a good pace. I am confident that it will provide a strong foundation for further regional and international cooperation in Central Asia and beyond,” Ashikbayev said. The video address of UN Secretary-General Ban Ki-moon was also shown to the gathering. “United Nations treaties addressing inequality, torture and racism have protected people, while other agreements have safeguarded the environment. UN peacekeepers have separated hostile forces, our mediators have settled disputes and our humanitarian workers have delivered life-saving aid,” Ban Ki-moon said. “At this critical moment, let us reaffirm our commitment to empowering the marginalized and vulnerable. On United Nations Day, I call on Governments and individuals to work in common cause for the common good,” he concluded.